GUARANTEE YOUR PLACE AND FOLLOW THIS LINK TO REGISTER. Plenary – Getting it right! Speakers: Helen Gregson and Andrew Newman, Members of the IFoA's Professional Skills Sub-committee – This session is designed to meet the IFoA's Stage 3 Professional Skills Training requirements for experienced members. Plenary – Navigating across Paradigms: Managing the Greatest Risk of All – Speaker: Tan Suee Chieh, IFoA President-elect –This is a wide-ranging discussion on how actuaries can re-think about its role in a world impacted by technological and business model disruption, 100-year lives, demographic and regulatory changes. Plenary – ESG: The insurance industry’s opportunity to change the world? – Speaker: Ryan Allison, EY – ESG and sustainability risks: a high profile concern or a “nice to have”? Plenary – Actuaries moving into Automation In 2018 – Speaker: Christopher Jones, Admiral Group – Christopher moved from head of ERM at Admiral Group to lead a new department focussing on delivering automation solutions including robotics, OCR and chatbots. This talk discusses a number of the steps he has taken along the way. Workshop – ‘An emerging risk process that can cope with Brexit’ – speaker Neil Cantle, Chair of the Risk Management Board – the session is based on successful studies. Workshop – ‘Analysing analytics risk’ – speaker Matthew Edwards, Actuary at Willis Towers Watson – exploring some of the fundamentals of machine learning and ‘big data’ use with particular regard to the related risks and their management. Workshop – ‘Equipping the Risk Function with a strategic mindset’ – speaker Kirsty Leece former Chair of the Risk Management Lifelong Learning Committee – discussed how can companies organise their risk functions to help support and enhance strategic decisions. Plenary session Mon, 20/05/2019 - 17:45 - 18:45 Plenary 1: Getting it right! This session is designed to meet the IFoA's Stage 3 Professional Skills Training requirements for experienced members. Presenters from the Professional Skills Sub-committee will use a variety of formats, including video case studies, to aid interactive discussion on a range of professional ethical issues. The materials will be selected from the 2018/2019 suite of professional skills materials and tailored to the target audience. A full programme of plenary and workshop sessions to be announced soon. Managing the Greatest Risk of All. The actuarial profession faces an existential crisis. The skills sets we have are under onslaught from data analytics and machine learning. The industries which employ us are subject to enormous pressure by emerging new digital and platform models. What new analytical techniques, competencies and domain knowledge do actuaries need to reinvent itself, and consequently re-imagine a new future? This is a wide-ranging discussion on how actuaries can re-think about its role in a world impacted by technological and business model disruption, 100 year lives, demographic and regulatory changes. Navigating the investment obstacles for insurers in renewable energy opportunities such as offshore wind: how can insurers invest in the future of our society, whilst catering to their own interests? The investment choices of private occupational pension schemes, affecting the quality of life of pensioners, are made by few individuals: pension trustees. In a series of experiments with pension trustees, we investigate this unexplored area of behavioural finance. We found that trustees are unduly influenced by irrelevant information, such as number of funds, labelling of funds, and poor external advice. Trustees are not immune from decision biases, and the effects are moderated by financial experience and literacy. Insurers across life, non-life and health are making increasing use of advanced analytics and 'big data' in many areas, from pricing to capital modelling. While the popularity and power of these techniques has increased much, there has been no commensurate increase in understanding many of the generally hidden fundamentals. Insurers are becoming more exposed to the risk of misapplied techniques, data bias, algorithmic bias, model misapplication, stakeholder misunderstanding, ethical problems in model application .This session explores some of the fundamentals of machine learning and 'big data' use with particular regard to the related risks and their management. We completed a study in the run up to the referendum using artificial intelligence to look for indicators around Brexit which could give more information about the potential outcome and the reasons for it. The results were spot-on. We repeated the work on the subsequent election and again were spot on. This session will give a practical insight into how these approaches can be used (using Brexit and other examples) and how they enhance your emerging risk process. The approach should also appeal to an international/wider fields audience. This presentation will cover the recent IFoA working paper looking at how actuaries might allow for climate change when advising on long-term financial assumptions, in the context of UK defined benefit pension schemes. 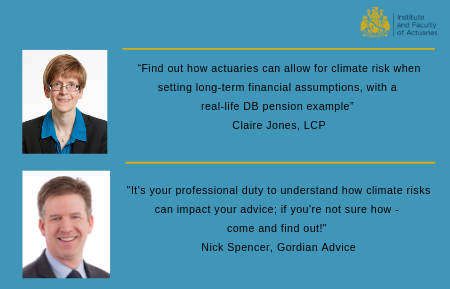 It will cover : why actuaries need to consider climate related risks overview of current research and areas needed for development role of scenario analysis & considerations on using it, a pension fund case study on the use of scenario analysis practical next steps for actuaries. Five years after the introduction of pensions freedoms, this presentation will demonstrate how DC savings platforms are exploiting risk management methods and emerging FinTech to engage customers and enable mass-customized investment solutions. How can technology be used to reshape retirement outcomes for savers faced with complex financial risks? Re-aligning investment thinking & managing regulatory barriers: where can actuaries influence the pace of innovation? Where will emerging FinTech change customer expectations and disrupt established players? B3: Are actuaries good at setting asset allocations for insurers? Many actuaries engage in setting strategic asset allocations (SAA) for insurers but how effective are actuaries and actuarial techniques in this area? Finally, we look at some cutting-edge approaches to SAA and the challenges they might pose for insurers. New risks are emerging and previously well-understood risks are changing! However, insurers are still using the same risk management techniques they were ten years ago. This presentation will cover the implications of a changing risk landscape on the tools and techniques required to manage and oversee such risks. Do we need more than just impact and likelihood? How frequently should we run scenario analysis? Is having imperfect information today better than having more accurate information in a month? We will explore why continuing to use outdated techniques is equivalent to trying to fit a square peg in a round hole. Plenary session Tue, 21/05/2019 - 13:15 - 14:15 Plenary 3: ESG: The insurance industry’s opportunity to change the world? ESG and sustainability risks: a high profile concern or a “nice to have”? Navigating the rising tide of regulatory activity with respect to sustainability risks. Disseminating the impact of regulatory change on insurers: what levers do insurers have? Physical and transition risk: how can firms generate realistic, relevant and idiosyncratic scenarios? How can my firm benchmark itself against peers in order to seize the initiative? Is it possible to generate alpha and minimise beta through ESG? How do you define a long term value framework? Many schemes consider a buy-in as this interim step towards a buy-out. However, given that the majority of buy-ins cover only pensioners, care must be taken to consider the impact on the scheme as a whole. Looking through this lens, carrying out a buy-in could make the overall portfolio outcome less certain and make it more difficult to achieve a full buy-out. We consider some of the potential issues associated with use of buy-ins, suggest an analysis framework that schemes should consider before making a decision and examine alternative de-risking options that could help schemes reach their endgame with greater certainty. How can companies organise their risk functions to help support and enhance strategic decisions? How can strategic risk management support businesses and enhance their success? What practical structures and measures that have worked in the past? How might these structures need to change in the future? Speakers: Kirsty Leece, Willis Towers Watson. Papers will be added to the website closer to the conference.